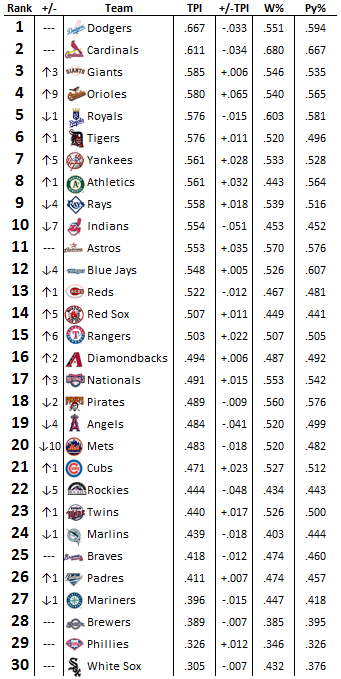 With methods described in this post, here are the latest MLB power rankings! TPI = Team Performance Index (my ranking metric). Based on wRC, DRA, DRS, and UZR. The Baltimore Orioles shot past the Rays and Yankees to claim the top spot in the the AL East in this round of the power rankings. They are in the midst of a 17-5 run, and about half of those games have come against AL East opponents (6 vs. Red Sox, 3 each against the Yankees and Blue Jays). They are riding a resurgent Ubaldo Jimenez, who looks as good as he ever has looked during his career, and a brilliant first-half performance from Manny Machado, to push to the top of the AL East in both these rankings as well as real life. I enjoy baseball more when the top of the AL East is not the Yankees or Red Sox, so this makes me happy.